Numerous studies have already proven the direct correlation between natural light and a person mental well-being and productivity. Therefore, window coverings, Blinds, Shades, Drapery and Shutters, should never be an afterthought in any home renovation project. It not about “just covering your windows”. With that mindset, one would gravitate toward the lowest common denominator (i.e. lowest price), resulting in selecting products that are difficult to operate (therefore you just leave it in one setting), do not protect your floor and furnishings from harmful UV, and limits the benefits of natural light and preserving outside views. At Trendy Blinds & Closets, we conduct a quick need assessment when you come to our showroom and then recommend different products to suit your needs and budget. Put in at least 20-30 minutes of your time during your first visit to our showrooms and then end results for your home windows will be something you will enjoy using and looking at for many years to come. Visit Trendy Blinds & Closets – 2 Showrooms to serve you! 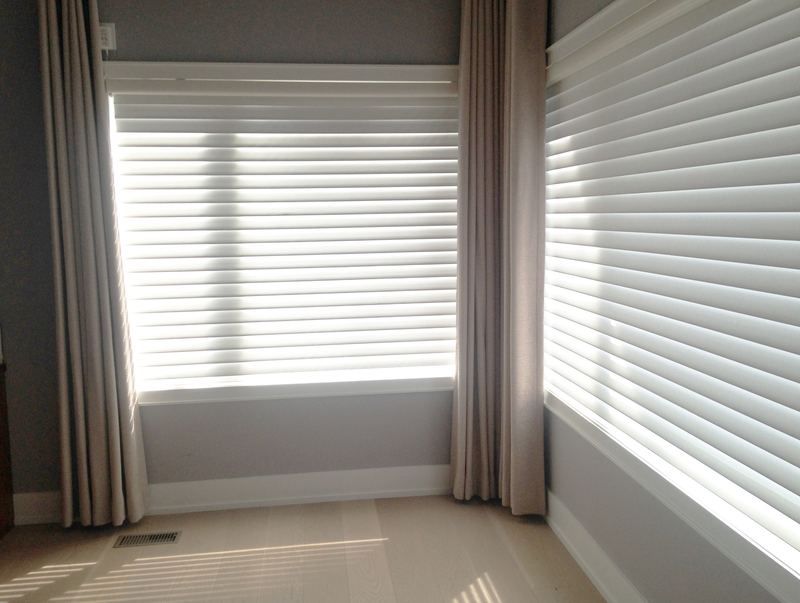 Combi shades or Zebra Shades allow 3 level of light settings 1) Open, 2) Closed and 3) Rolled Up. It filters light, maintain privacy, allows view of outside and are very simple and quick to operate – allow up to adjust your blinds multiple times throughout the day as your daylighting, and privacy needs change. With the kickoff to Black Friday and the start of the holiday shopping season, here’s a tip I learned to help you in your purchasing decisions: “Buy Once, Buy Right“. What I have learned through years of holiday shopping and also as a retailer, is that to ensure 100% satisfaction with your purchase, it is important to first focus on quality. The product needs to serve its intended purpose well and last long to lower the total cost of ownership. Second, seek true value. What this means, is that while well known quality brands might help identify quality products, are you paying a premium price for that brand? Or are you getting a good discount and good service for that purchase? Alternatively, does the store offer similar quality products (but not famous brands) at a much better price? For window coverings (blinds, drapes, curtains, shutters), you must also factoring in the service you will get in purchasing the products so that you get the right size, options and features, installation, and post-installation support. Trendy Blinds is focus on selling top-quality products – both well-known brands and our own Trendy Blinds brand of products at a great value, which include expert advice and first-class dedicated service. For December to further help you make the right purchasing decision, we are offering an unprecedented DEAL: 50% Off our industry-leading, globally patented, highest quality room-darkening combi blind — our Dual Combi Sun Shut product (with minimum purchase of 7 of these blinds. Can specify different finishes for each). This one time offer ends December 31st, 2015. With some trend forecasters talking about how most things will be shopped online (for example groceries, electronics and clothing), one may wonder if anyone spends anytime shopping (and living) in the real physical world anymore. However, we at Trendy Blinds believe now, more then ever, it is important to have a showroom to showcase a wide selection of quality window covering (blinds, shades, drapes, shutters) products, so that the consumer can make a more informed decision driven by factors beyond just price, such as quality, features, and service. Furthermore, even home consultation, which primarily provide small material samples swatches, cannot properly showcase complete functioning products and provide a quick overview of all the possible features and options available in decorating your windows. While we provide free measurement (within a geographic boundary), we insist that potential customers come visit our showrooms (one in Markham and another in Concord, Vaughan) to finalize their selection. With over 200 products on display and both showrooms located in very convenient shopping centres with amply free parking, plus our in-store window covering designers to provide guidance and advice, there is no reason not to make a trip before deciding on spending possibly thousands of dollars. Will the choices made enhance the value of your home? Do the products chosen for certain windows fit into your daily life and usage instead of providing frustration and possibly even safety risks to your child or pets? Did you really get the best price on quality products or just low price on junk bait-and-switch products from vendors who don’t have a showroom? 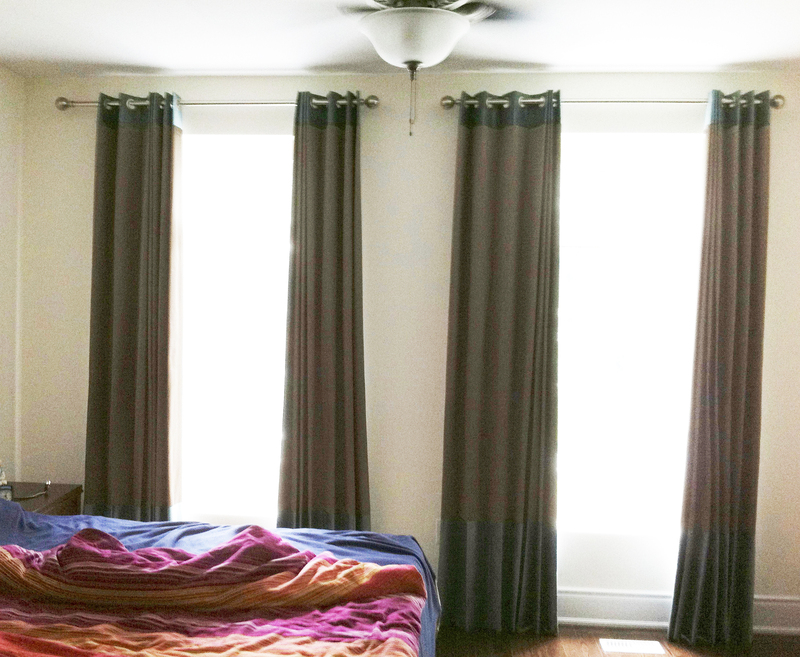 Why Do Custom Drapes / Curtains Cost More? Every so often we get potential customers looking to buy custom-made drapery for the very first time. Invariably, it leads to the question of why custom drapery cost significantly more than ready-made drapes/curtains they see at a local big-box store. 4) The expertise and experience that comes with the price you pay to make the drapes transform the look of your window and room. 2) Cheaper fabrics come at a social and environmental cost – these fabrics are often made with bonded labour in some third-world factories frequently with underage workers. Recent Apple 2015 Supplier Responsibility Progress Report shed light on the common practice of “Recruitment Fees” that workers pay in order to work for manufacturers in the electronics industry. Unfortunately, this practice is not just limited to that industry but also in the fabric and drapery industry in these poorer countries. Workers are forced to work long hours in sweatshop environments. At Trendy Blinds our commitment to our customers is that all our drapes are Made in A Workshop Not in a Sweatshop. 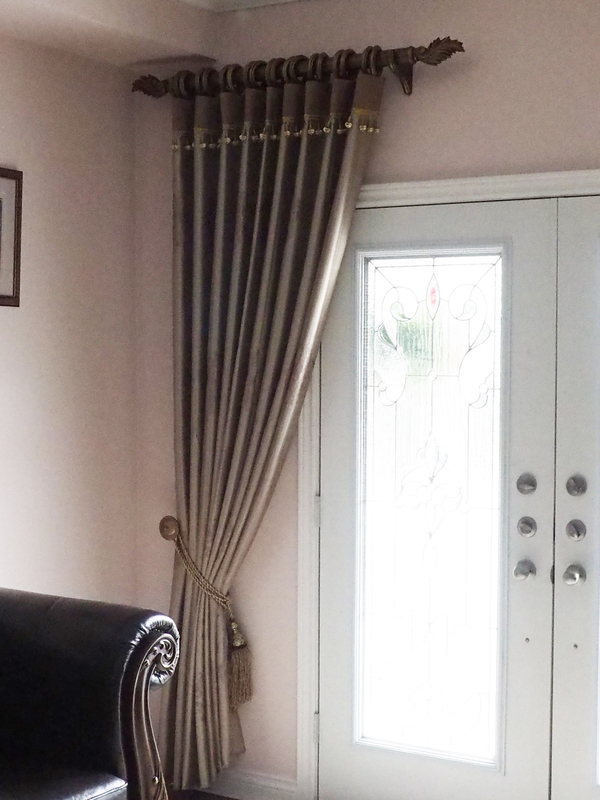 We also carry a line of lower priced Ready-Made Drapes that are Made In Canada. 4) We clearly post prices of our drapery and apply set volume discounts. $100 is applied to the first pair of custom drapes per customer per address. Cannot be used in conjunction with any other promotion or discounts. 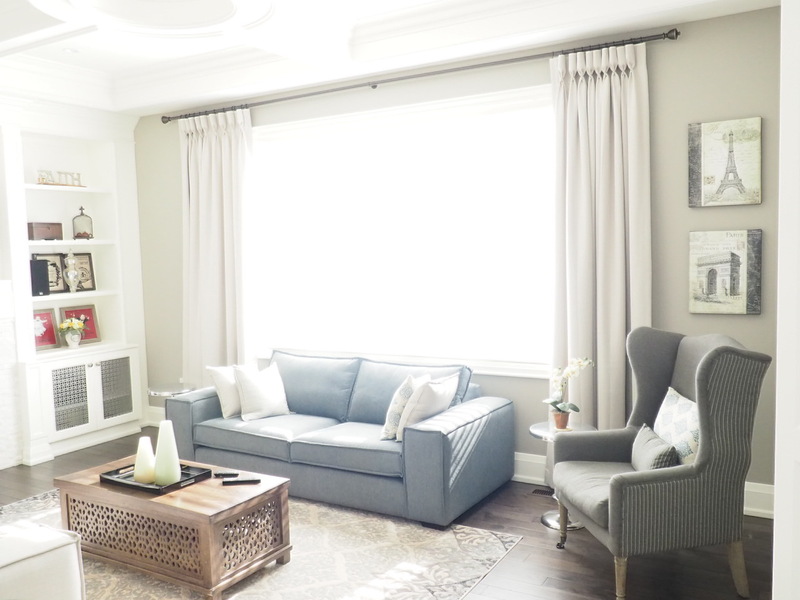 Show below is a recent customer install of our popular Trendy Blinds Semi-Custom Drapery – which is custom drapery at half the price Our program saves a lot of time for the customer in designing style and selecting fabrics. Fabrics can be mixed and match from hundreds of choices that have been pre-screened to ensure they work together and can be made in one of the 7 styles available. 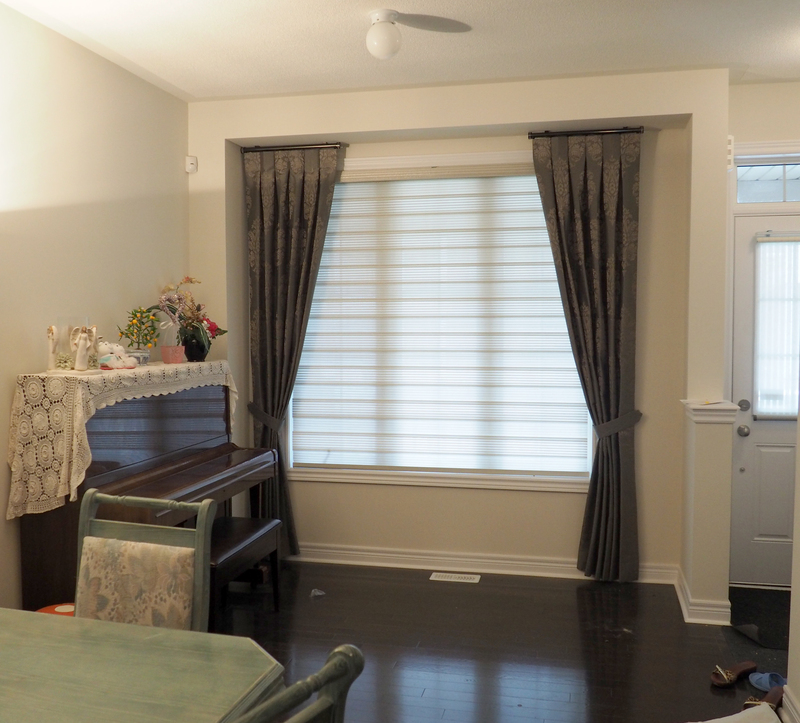 Show here at our customer install at the Beaches in Toronto are the Lindsay panels with grommets using silk middle fabric and a poly-cotton “Ocean” colour fabric for banding top and bottom (For more general info on our Semi-Custom Drapery program check http://www.trendyblinds.com/draperies-semi-custom.php). To specify Trendy Blinds Semi-Custom Drapery Just provide your window and wall size and come visit our store. We will guide you through the selection. Our prices are clearly listed in our store.